This two-story, hip-roofed I-house is three bays wide and single-pile with a one-story gabled ell at the right rear (southwest). The house has plain weatherboards, six-over-six wood-sash windows, wide eaves, and a stuccoed chimney at the right rear. A one-light-over-two-panel door is centered on the façade and has a three- light transom. It is sheltered by a hip-roofed porch that extends the full width of the façade and wraps around the left (east) elevation. 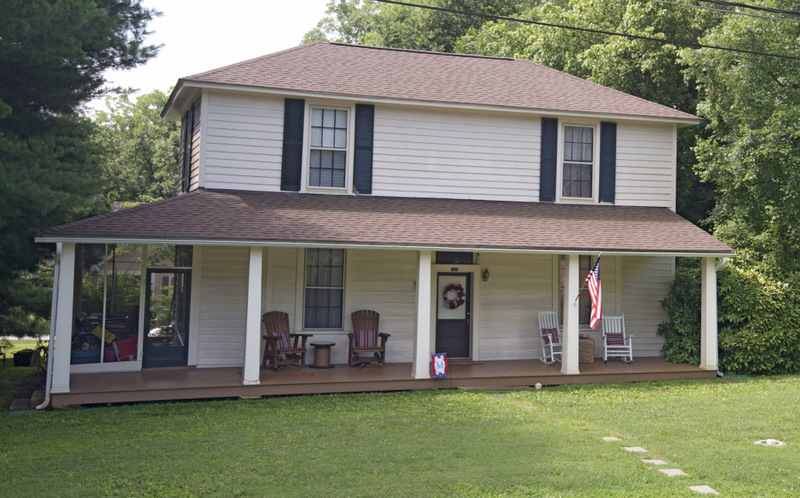 The current porch, constructed around 1911, is supported by tapered square columns and the left end has been enclosed with screens. Flush sheathing at the center of the façade indicates that the structure had a narrower porch originally. An engaged, shed-roofed porch on the left elevation of the rear ell has also been enclosed with screens. Inside, the house retains HL hinges, bible and cross doors, and a board and batten door. This may be one of the earliest houses in Hillsborough, since, according to Bellinger, a house similar in shape and size to this one appears on the Sauthier Map of 1768 and was originally flush to Margaret Lane. A house located next to the street appears on Sanborn maps as early 1894, though the home was likely moved to its current location around 1911 as it appears in this location on the 1924 Sanborn map. The house is associated with Scott family, though the association has not been documented.